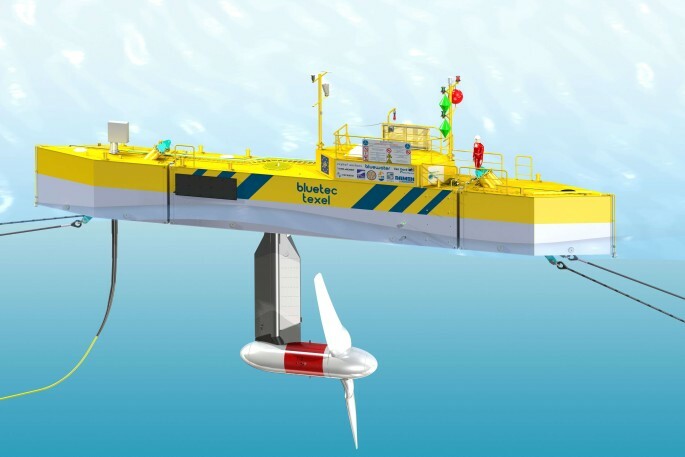 The first BlueTEC Tidal Energy platform was formally named BlueTEC Texel. The floating platform, which holds tidal turbines beneath the sea surface, installed south of the island of Texel is supplying clean electricity to the Dutch grid. The project draws on the specialist skills and experience of an impressive list of partners, many of them having their core business in the offshore oil&gas industry: Bluewater, Damen/Niron Staal, Van Oord/Acta Marine, Vryhof Anchors, TKF, Tocardo, Schottel Hydro, NIOZ, Tidal Testing Centre, Nylacast, Port of Den Helder. The BlueTEC platform is an application of Damen’s modular barge system – a flexible product that can be put into effect in the construction of a wide range of vessels from dredgers and jetties to ferries and pontoons. Damen used three standard container-sized modules to construct the Texel platform. The efficiency of containerized transportation combined with uncomplicated assembly means that the platform can be transported and installed anywhere in the world.